A frosty start, slightly snowy and icy underfoot along the rides through the wood, but then a lovely sunny day, and surprisingly warm once the sun rose above the trees. This is the twelfth year we have been involved in the management of Scotgrove, and this was our second visit this winter. 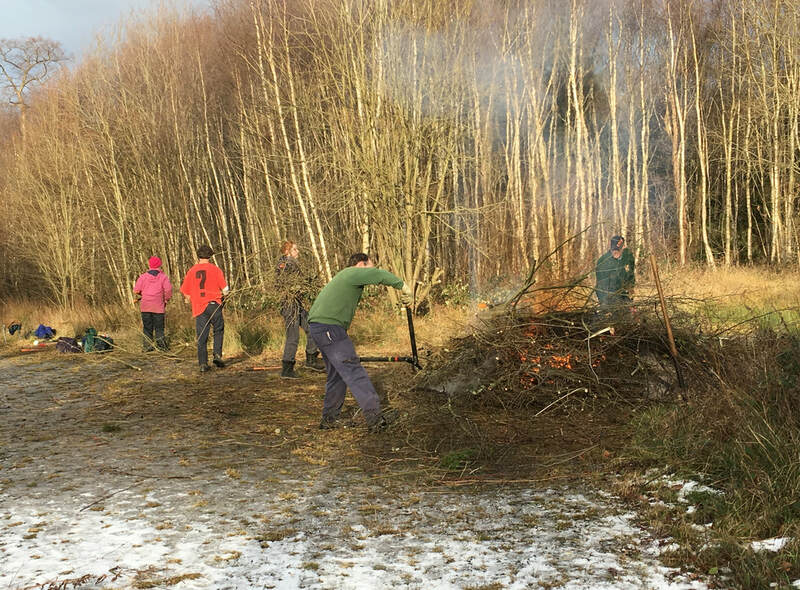 Over the years we have cleared glades in the woods and scalloped the edges of the rides to create more open habitats with different light levels that encourage more spring and summer flowers that in turn attract more insects and other wildlife. But everything keeps on growing so on Sunday we had two specific tasks. One was to cut back regrowth along part of the track where blackthorn grows, to clear the willow and hazel that can overwhelm the blackthorn. Coppicing the blackthorn encourages new young growth where the Brown Hairstreak butterfly will lay its eggs. Blackthorn is the sole food source for the caterpillars, but old stuff is no good. I love website references to ‘conspicuous white eggs’. For anyone who has looked for them (and Richard is our expert in this), I don’t think the word ‘conspicuous’ would spring to mind for a tiny, pin-head sized single egg tucked tightly into the angle between a branch and a side shoot, although to be fair the egg is white and the blackthorn stem isn’t! 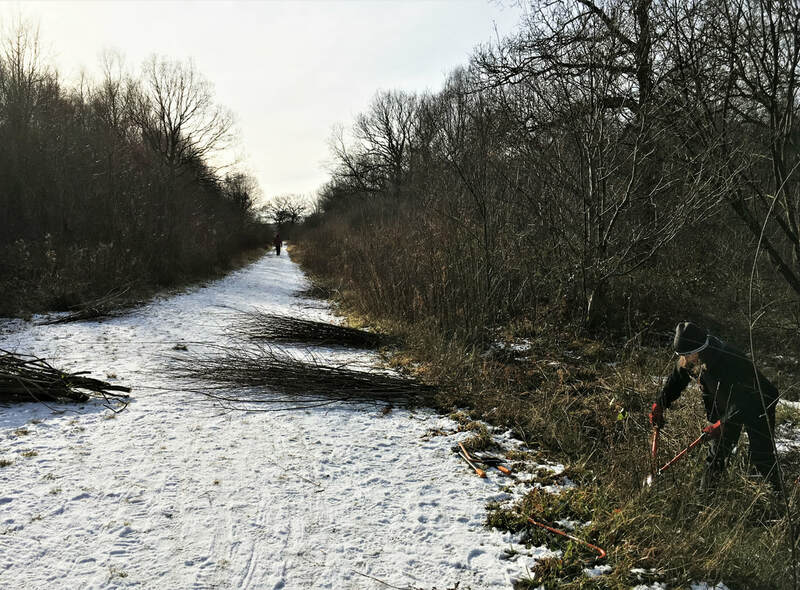 Our second task was to cut back 2- or 3-year-old regrowth to open out the area where several rides meet and then to cut back further into the wood on one corner, removing silver birch and willow, to create a more open sweep from the ride into a glade that we had created in a previous year. 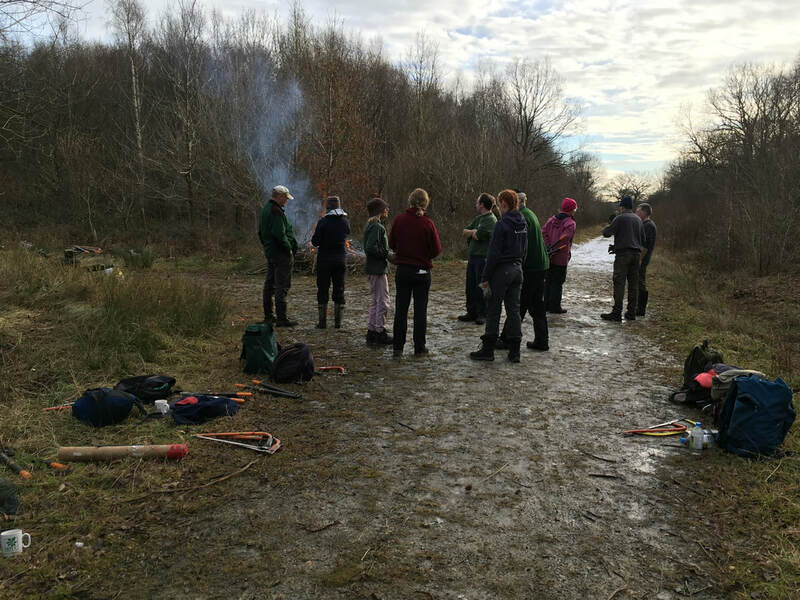 We had a good turnout – fourteen of us – and using bowsaws and loppers we made good progress. Nick very quickly got the bonfire going, and by the end of the day all the cut wood had been burned or stacked into habitat piles. Jonathan cooked a jacket potato and baked beans for his lunch (though he also had a sandwich as back-up just in case …).